The first task on your list should be to clear away large pieces of debris. Using plastic gloves, gather any leaves, twigs and piles of dirt you wish to discard and toss them into a small plastic bag. 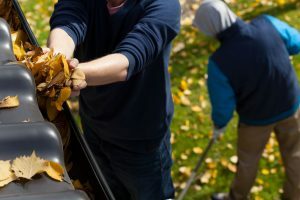 After all large pieces of debris are disposed of, you must then check for patches of decomposed leaves or dirt that may have compromised certain areas of the downspouts or gutters. A small putty knife it is a great tool to break up stubborn patches of debris. However, do not use the tool in a rough manner, as this may result in a damaged gutter. To remove any remaining clogs, run water through gutters and downspouts with a garden hose and have someone check to see if the water is coming through freely on the other end. If the water is flowing through slowly and still contains some debris, keep the stream of water going until it runs clear. 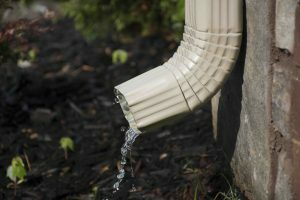 If the downspout of your system leads directly to the drain, you should first disconnect the two areas so that debris is not accidentally pushed into the drain and another problem created. When the system has been cleaned and unclogged, you should also tighten any loose nails and screws while you are still on the ladder, as this will save work later. Virtually all homeowners want a safe and comfortable dwelling, and following the aforementioned gutter tips will help you jump start your spring home maintenance. Finally, if you suspect your home has a gutter or roof problem, contact a professional as soon as possible to inspect the area and offer an estimate. Most property owners realize that gutters provide protection from debris, leaves and dirt that would otherwise coagulate on the roof of the home. Nevertheless, some people fall into the trap of overlooking gutters until serious issues occur. Fortunately, installing guards and cleaning gutters on a regular basis are not difficult tasks. Below are some Springtime gutter tips to help you protect your home from moisture damage. Install Gutter Guards. Without gutter guards a house is susceptible to various types of damage, some of which may be serious. Leaky roofs, rotting wood, seepage of water into the basement of the home, and even damage to the foundation are all possibilities if such guards are not used. The primary purpose of these devices are to prevent the aforementioned clogs from occurring in the first place. This allows the water to drain appropriately, which eliminates the need for frequent Springtime gutter replacement and helps to prevent damage to the home. Regular Gutter Maintenance. 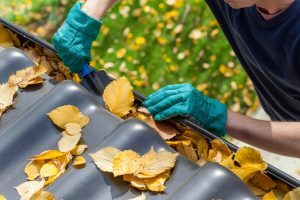 Using plastic gloves, you should remove all visible dirt, leaves, twigs and other debris that may have collected in the gutter during winter. If necessary, use a putty knife to remove stubborn areas of decomposed foliage, but use this tool gently to avoid damage. Next, thoroughly rinse the gutters with the garden hose to ensure any traces of dirt or leaves are removed. Springtime is also a good time to tighten loose screws or nails. Checking the downspout for obstructions is a good idea as well, which is easily accomplished with a strong spray from a standard garden hose. If the downspout of your gutter system goes directly to the drain, disassemble this part before using the garden hose so that you do not accidentally force debris into the drain and ultimately create another problem. Finally, if you notice any roof problems or it appears that the time has come for new gutters, contact a professional to obtain a free quote for this project.